Tomato soup is nutritious as well as easy to make. It is a quick recipe. Do you love tomatoes like I do? I like to add them to my salads, curries. 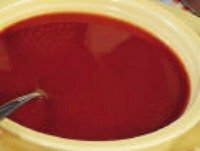 With this tomato soup recipe, you have another interesting way to add color and nutrition to your meal. Your family will love it too. Tomato soup is good to have at any time but I like it best in the cold evenings. During winter or at other times too, it is a favorite at home. Serve it with garlic bread and it disappears within minutes. I am using fresh tomatoes for this recipe but you can use the precooked or canned tomatoes. You may also use store bought or homemade tomato puree if you wish. Just check if salt is already added or not. And add less salt while making this soup. black pepper powder - 1/2 tsp or to taste. Preparation: Wash tomatoes. Chop roughly. Boil 1 cup water in a pan. Add tomatoes to it. Cook for 5 minutes or till tomatoes are just done. Take off fire. Puree the tomato along with the water in which it was cooked. Pass through a sieve to remove skin and seeds. Put the puree back in the pot. Add 1 cup water. Bring to boil. Mix corn flour in a 1/2 cup water. Add to the soup mixture while stirring so as not to form the lumps. Let it boil for a minute. Check for consistency, add more water if needed. Add salt, sugar, and pepper powder according to taste. The soup is ready. Add cream or butter just before serving in the soup bowl. Serve hot with croutons or garlic bread. Enjoy your Soup with your family and friends. You can add a little butter or milk just before serving. Vegans can add coconut milk or cream instead of dairy milk.